Free college tuition is making headlines across the country, from politicians touting it as the wave of the future, to high school seniors on a last-ditch, hail-mary Google search when everything seems a little out of reach. The New York Times reported on a free college program for the state of New York’s SUNY and CUNY schools, that would make a big difference for middle-class families. Many Ivy League schools have done away with tuition for those lower-income applicants who qualify. But just like anything that is advertised as free, you have to ask yourself, what’s the catch? 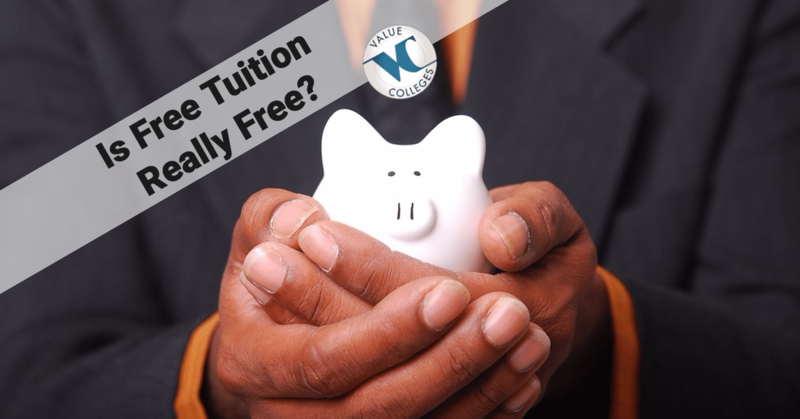 We all know that free rarely means free, but what could these schools mean by no tuition? It is in the best interests of universities with great reputations to admit students who are the best of the best, whether they can afford it or not. Many Ivy League and other top ranking schools are tuition-free if your family makes less than a certain amount of money annually. For Harvard and Yale Universities, free tuition starts for students with a family income under $65K. Of course, getting accepted by these highly selective institutions is a pretty tall order, so be prepared to work hard. Similarly, Brown University, Columbia, Cornell, Duke, Stanford, and Texas A&M Universities all offer free tuition to students with family income under $60K. Also, like the others, getting into these schools means you deserve it. In the category of earned family income, no school is as generous as the Massachusetts Institute of Technology (MIT), offering free tuition for students with families who earn less than $75K per year. With an acceptance rate of only 8 percent, MIT makes you work for it in other ways! Most people don’t think of college as easy. If you are looking to attend a tuition-free college or university, easy should be the farthest thing from your mind. For schools like Alice Lloyd College, Berea College, The College of the Ozarks, and Deep Springs College in California, everyone may attend tuition-free in exchange for hard work and dedication to service for the school or to the surrounding community. If you are a really unique learner, you just might find a tuition-free school fitting for you because you’re you. For example, Barclay College offers Quaker religious studies and students only pay room and board, while The Cooper Union offers tuition-free programs limited to engineering, fine arts, and architecture. Perhaps you are gifted at music and want to attend the Curtis Institute of Music; studies include opera, orchestra, piano, and composing. If so, it will be free; you’ll just have to wait to fill an empty orchestra seat after someone moves on. Lastly, maybe you will want to test your sea legs at Webb Institute for naval architecture and marine engineering. Keep in mind though, students do have to cover books and fees. So is free tuition really free? Sure, under the right circumstances: if you have amazing grades and come from a family who makes a little less, or you are not opposed to working double time on school and at your school, or you study something so specific there’s really no way to price it, you’ve got nothing to lose by trying.